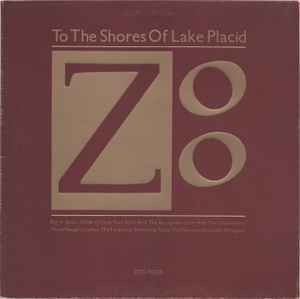 The music on this record has been taken from the play 'To The Shores Of Lake Placid', which ran from August 24 1978 to February 21 1981. The play is the first in a trilogy, the second of which, as yet untitled, began on November 10 1981 at 'Club Zoo', 'The Pyramid', Liverpool, and will close at 'Erics', Liverpool on November 15 1983. All titles are performed by the original cast. Track A1 - previously unreleased. Recorded T.W. Studios October 1977. Licensed from Warner Bros. Music Ltd.
Track A2 - previously released as single (Zoo Cage 002) January 1979. Recorded Open Eye Studios, Liverpool. Track A3 - the original version, taken from the never released album 'Everybody Wants To Shag The Teardrop Explodes' (Zoo 1). Recorded Rockfield Studios March 1980. Track A4 - original version featuring Echo, released as single (Zoo Cage 004) March 1979. Recorded August Studios, Liverpool March 1979. Track A5 - b-side of Track A4, not the version on American copies of 'Crocodiles' or Korova Special Offer Version. Track A6 - originally released by Zoo Records through Korova Records. Recorded Rockfield Studios January 1980. Track A7 - previously unreleased. Recorded Rockfield Studios February 1981. Track B1 - from the forthcoming album 'The Fuel Of The Big Machine', licensed from 'Radio Peeking Duck'. Track B2 - originally released on Back Door. Recorded Rockfield Studios early 1979. Track B3 - previously unreleased. Recorded Rockfield Studios February 1981. Track B4 - Brief remix of 'hit' single (Zoo CAGE 006) previously unreleased. Not credited on the package. Track B5 - previously released as b-side of 'Sleeping Gas' (Zoo Cage 003). Recorded Open Eye Studios, Liverpool November 1978. Track B6 - previously released on 'From Y To Z And Never Again' (Zoo Cage 001). Licensed from Warner Bros. Music Ltd.
Track B7 - recorded for John Peel Session May 1979. With kind permission of the BBC. Track B8 - previously unreleased. Recorded Cargo, Rochdale November 1979. All songs published by Zoo Music/Warner Bros. Music Ltd, except Track B2 published by Green Dream. (p) & (c) 1982 Zoo Records. Issued in an embossed gatefold sleeve with four page stapled photographic insert.